Acacia davyi (Leguminosae). Corky Thorn (e), Kurkdoring (a), isiKhwishi (z). Hardy, drought resistant, deciduous, small Acacia with distinctive yellow or light brown corky bark on the stems and branches. It has clusters of bright yellow puffball flowers on the ends of the branches from Dec. to Feb. These are followed by bunches of long narrow pods. 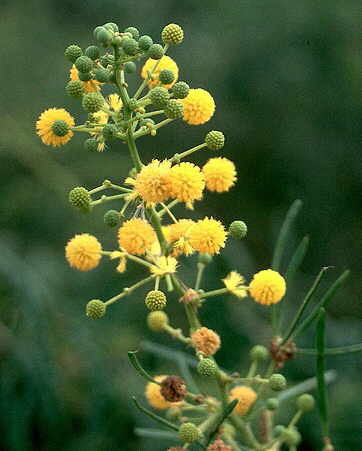 An attractive Acacia for small gardens planted in sun or semi-shade. Attracts birds and insects to the garden. Size 1.5 to 3m. Sowing : Soak seeds overnight in water and plant. Locality : Pietersburg. Date of harvest : Oct 2018.